AMONG the leg warmers, lycra and electrifying dance routines there was teen angst, tragedy and romance. Fame The Musical exploded onto the stage at The Mayflower to a rapturous reception. Almost every number was greeted with whoops and cheers from the packed house - never louder than when How Do You Solve a Problem Like Maria? runner-up Abigail Finley took the spotlight. Finley put in a lovable performance as love-struck teen Serena Katz - just one of the fame-hungry pupils at New York's High School for the Performing Arts. Based on the Academy Award winning movie, the high energy musical follows the fortunes of the wannabe performers as they hone their stage skills and learn the price of fame along the way. In a sparkling cast of young performers, Carlton Connell shone as rebellious Tyrone Jackson, a reluctant student but gifted dancer. His slick moves on the dance floor coupled with his angry adolescent posturing off it, went down particularly well with the teenage girls in the audience. From street dance, to hip-hop, ballet and Latin, the show was a feel good dance-fest from start to finish. Given the musical's searching for stardom theme it was appropriate that Strictly Dance Fever winners Hollie Robertson and Darrien Wright were spinning and flipping with the best of them as members of the dance ensemble. Most of the audience were on their feet by the time the spectacular finale scene - complete with New York taxi cab - played out. 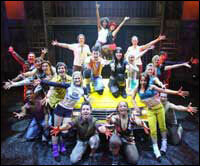 Fame The Musical is at The Mayflower until Saturday, February 3. Box office: 023 8071 1811.